SO EXCITED! Thank you @HPMarketNews! EXCITING NEWS! HADLEY COURT SELECTED AS A 2015 #HPMKT STYLESPOTTER! Readers, the entire team at Hadley Court is thrilled to share with you today that Leslie Hendrix Wood, the owner and founder of the Hadley Court blog, and an interior designer in Midland, Texas, has been honored by being selected, out of thousands of submissions, to be part of the prestigious High Point Market StylesSpotter program for 2015 by the High Point Marketing Authority, the official marketing arm of High Point Market, supported by the state of North Carolina, along with 8 of her fellow designers, pictured above and listed below. 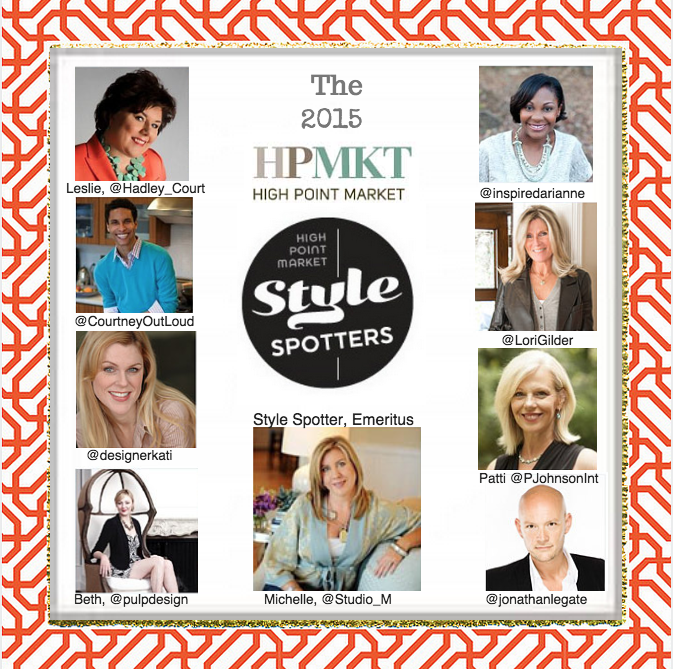 who guides the new StyleSpotters each year and assists with official StyleSpotter events at High Point Market. Michelle was also recently named to the board of directors of the High Point Marketing Authority to represent interior designers – an important constituency that makes up part of the more than 75,000 visitors attending the world’s largest international furniture tradeshow, twice a year, in High Point, North Carolina. These designers, representing both the United States and Canada, and from different parts of the USA – the East Coast, West Coast, South, Southwest and Middle Atlantic states – will bring you, along with Leslie Hendrix Wood, all of the new style directions from both the Spring and Fall High Point Markets in 2015, and will be responsible for *spotting* the exciting products from the exhibitors showing at #HPMkt that reflect their own design vision and unique points of view. You can read the full press release and find out more about each StyleSpotter by clicking on the Furniture World magazine link, here. In addition, we have other good news to share today! 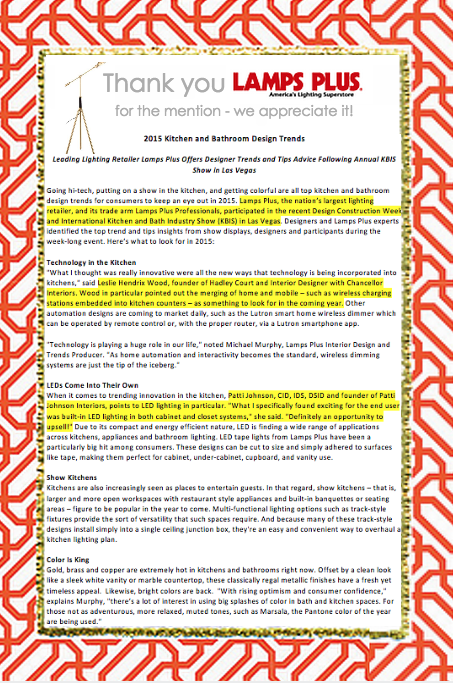 We would like to thank LAMPS PLUS, one of our country’s largest lighting retailers and e-tailers for featuring a quote from Leslie Hendrix Wood in their national PR release that went out today about 2015 Kitchen And Bath Trends. 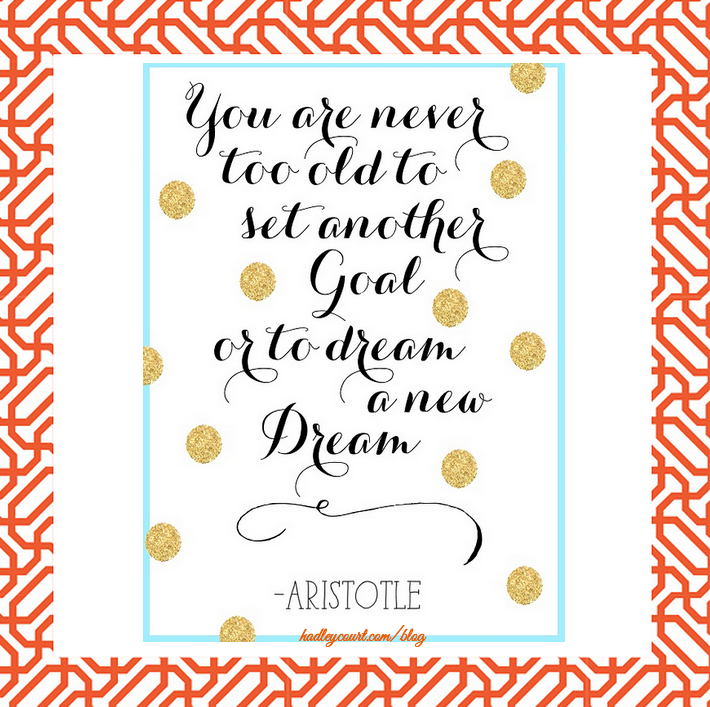 We hope you enjoy reading this article that also featured a quote from Patti Johnson, one of Leslie’s fellow 2015 #HPMkt StyleSpotters. We also look forward to bringing you more wrap up posts this week and next from Leslie’s #BlogTourVegas sponsors as we head towards Valentine’s Day, and if you missed the lovely post by HC contributor Kim Darden Shaver on Wilsonart about the marriage between surface materials and creativity, please click here, or the one about KBIS itself, by HC contributor, Lynda Quintero -Davids, please click here. 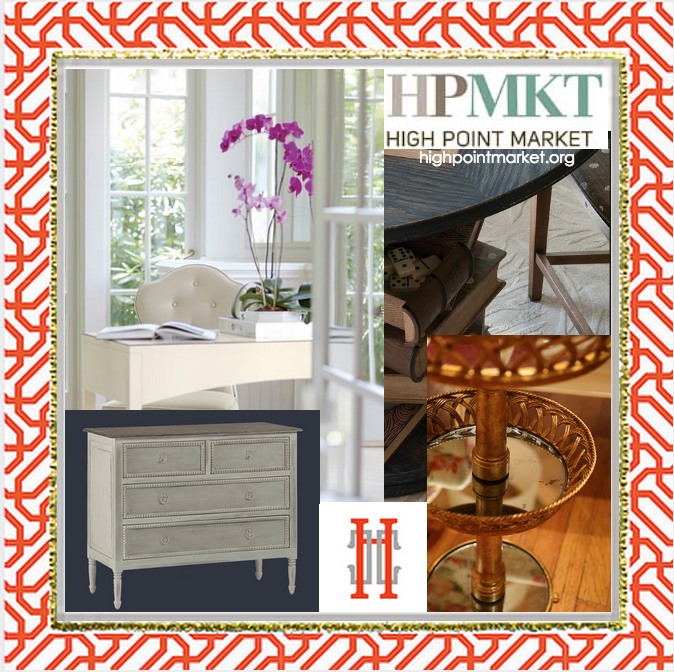 On behalf of the entire Team At Hadley Court, thank you, High Point Market! We look forward to sharing the best from #HPMKt with you, dear readers, come April 18th, the official start date of the Spring 2015, High Point Market, and our first stops will be at the showrooms of our wonderful 2014 Hadley Court giveaway partners: Bernhardt Furniture, Century Furniture, Gabby Decor and Jonathan Charles Fine Furniture. And readers, if you want Leslie Hendrix Wood to source new products for your own homes during her upcoming year as a #HPMKT Stylespotter, please be sure to reach out to her in the comments or on her Facebook Page at http://facebook.com/HadleyCourt. Thank you, as always, for reading Hadley Court. We appreciate YOU.